June 29, 2010 Random Enter your password to view comments. I’ve been itching to play around with some new footage lately cause I love editing and it’s been a while since I had a good story to tell, so when Tiana invited me to Bobby’s second birthday party, I couldn’t resist. I also recently purchased some new gear in preparation of a wedding I’ve been hired to film in the Fall (with a second one potentially lined up), and I’ve been looking for an opportunity to field-test a new bag, shoulder strap, and monopod. I tend to get really shy at Tiana’s parties cause I feel like I’m the only one who doesn’t know anyone else there, but she does a good job of making sure I’m never left alone for too long and included in most conversations. She’s also the only other person I know to actually design custom invitations. This time, however, she was sporting a perky new haircut, and no longer a vegetarian (for now). Such is the power of St. Hubert. 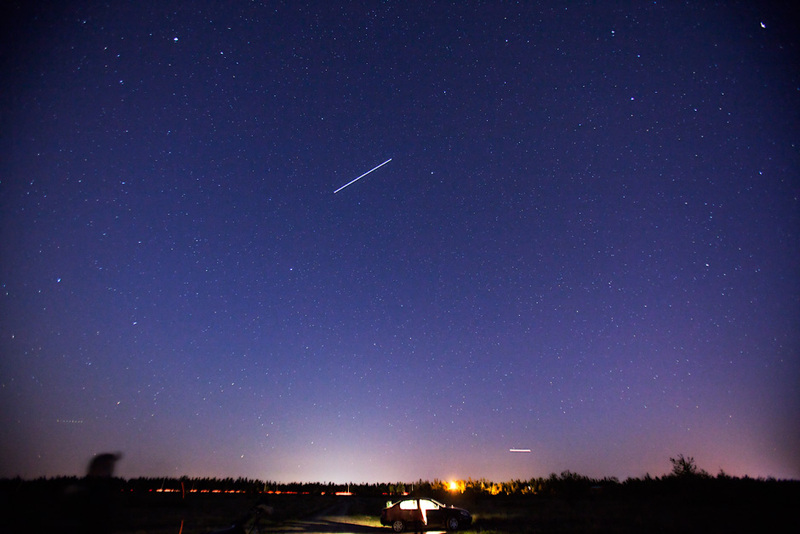 The International Space Station happened to be passing by when I was out doing some astrophotography. It’s a very high-profile object because it’s a lot brighter than any stars (it’s light coming from the solar panels reflecting the sun at us), and it blazes across the sky at an amazing speed. This last point is made obvious by the fact that all the stars appear stationary in the photo1, while the ISS made a brilliant streak. Also visible near the bottom of the picture are two low-flying aircraft. The one in the bottom left corner had blinking lights, which is why it appears as a series of dots in a line. 16mm focal length, f2.8 aperture, 13 second exposure, ISO1600. I only had about two chances to take this shot at this shutter speed, not because the ISS disappears behind the horizon, but because it eventually flies into the shadow of the Earth while it’s in the sky and is no longer illuminated by the sun. At it’s longest dimension, the ISS is only about 109m wide, which is roughly the size of the needle antenna on top of the CN Tower. It’s also orbits about 400 kilometres above the earth, which is roughly the distance from Ottawa to Toronto. So to capture the ISS in a telescope at that magnification is like being in Ottawa and pointing a telescope at Toronto and seeing the antenna on the CN Tower…as it’s moving at 8 kilometres per second. In American terms, this would be like standing with a telescope in Las Vegas and resolving the characters of the Hollywood sign in Los Angeles if it was moving at 17000mph. I rarely think of the one who loved me most, even though she still thinks of me. This isn’t on purpose; it’s a simple case of me meaning more to her than vice versa. I’ve avoided such an unrequited obsession with my last love. I stopped all contact, cut myself off from anything that’d prevent me from healing or moving on, and I’m proud of myself for having the strength to break such self-destructive habits. But I can’t hide from my own memories. When touched and inspired so significantly, one can’t help but remain forever changed. Between the choice of giving things a chance and losing me forever, she chose the latter. So I wonder if she ever thinks of me now, the one who will always have loved her most, or whether I’ve just become another one of the wounded boys who staggered and fell so helplessly against her graces. Got a ticket booked for France in the Fall. Instead of staying in Paris, I’m going to be living with Frédéric and Misun in the town of Chartres. That way I’ll save money on accomodations, since the train goes to Paris every hour, only takes an hour, and is much cheaper than a night for a hotel there. With three weeks booked, I know I’ll be able to go at my own pace in the city, with plenty of time to spend with Frédéric, Misun, and the boys too. These three Frommer’s books came in one pack. I was happy to find one that focused on Paris alone. 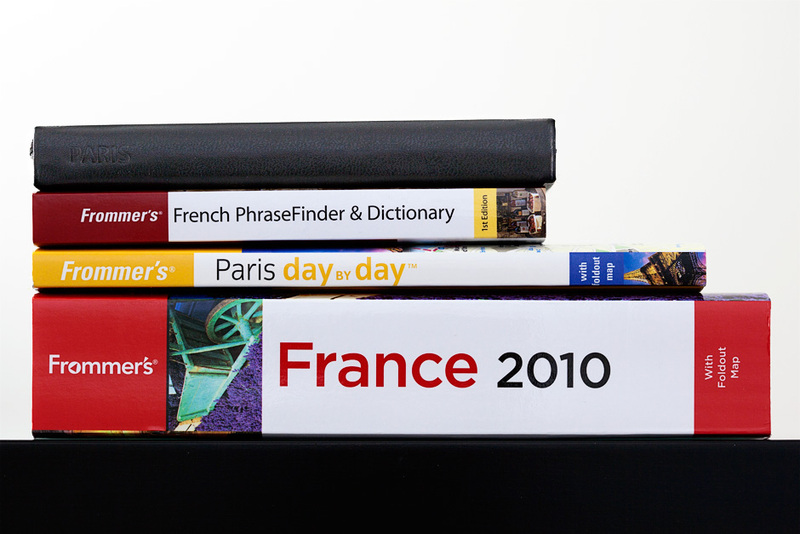 My French comprehension has rusted to the point of being non-existent, so the dictionary and phrase book seemed like a good idea too. It’s filled with hilarious phonetic pronunciations, like “ehs-kuh tueh praw~ lah peel-uel” for “Est-ce que tu prends la pillule?” or “Are you on birth control?” in the Getting Intimate section. I wouldn’t be surprised if Paris was the only city to have this section, which includes translations for “Harder!”, “Faster!”, “Deeper!”, and “May I come inside?” (although I suspect the last one isn’t exactly the meaning I’m thinking). 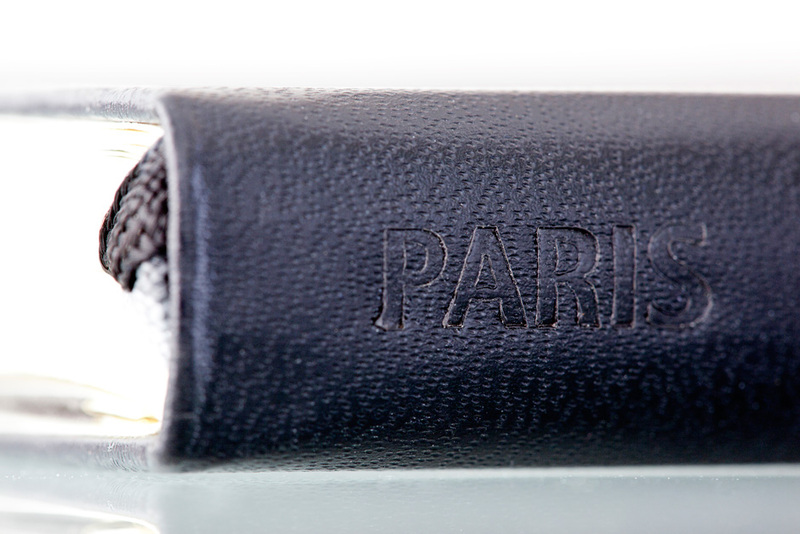 I also bought this Paris Moleskine, embossed with the city’s name on the spine. It’s overpriced for a notebook, but worth it for the convenience. Contains condensed versions of all the most useful information, including numbers for transportation companies (including air balloon!) and city maps.